Victoria’s life is a novel with the perfect ending yet to be written. Every novel needs a protagonist, an inciting incident, a goal, a point where the protagonist’s unyielding commitment to their goal is noted, and then the challenges begin. Like every award winning movie, the protagonist doesn’t give up despite those obstacles, and succeeds in achieving her goals. Slapped in the face with the flying bug, at a very young age, was Victoria’s inciting incident. When she turned sixteen she attended ground school and took her first discovery flight. Her goal to become a pilot was released to the wind. Her first challenge was how she’d pay for her training. She is so thankful that her parents enabled her to fly back into the nest to save money. But just like the perfect novel, the road blocks soon began. Medical issues delayed her private pilot training twice, but she persevered. Instructors left and FBO’s closed, but nothing could stop her. 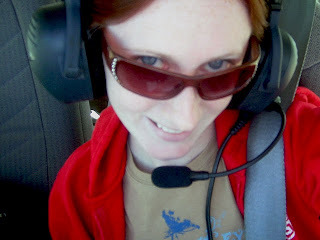 Then two years later, with loans in hand, she became a private pilot. Five months after that, she was instrument rated. Then the money dried up and she sat on the fence, literally, watching planes take off and land, figuring out how to keep her dream alive. When a door closes, another opens. Due to Michigan’s depressed economy the city began a “No Worker Left Behind” program, financing education. After five months of meetings and tests, she was granted funding and went running, with a hop, skip, and a jump, to the airport. She could not see anyway that she would not become a professional pilot now. She was preparing for her commercial checkride when life came to a sudden halt. She suffered a detached retina and was blind in a small part of her left eye. She underwent two laser eye surgeries to prevent further detachment, and was told by her doctor, and by AOPA, that she would not qualify for a medical. There was no way she would believe them. She also had played with aerobatics, some of the most fun flying she’d ever done, and now she was grounded from that too. Victoria's eyes have since healed, and she can see her dreams clearly again. She received her second class medical. Keeping near to the aviation industry, while she focuses on her dream, she now works for an aviation insurance company. Once again, she’s learning a new airport, and a new type of airplane to complete her commercial checkride, but she is flying. Nine years, seven instructors, three airports, multiple surgeries, and depleted private loans later, she’s still optimistic to a happy ending of the story she calls her life. Despite the continued obstacles, Victoria has dared to dream. With that dream, and her unwillingness to give up, she will become a commercial pilot, and continue to be an inspiration to all. Victoria has no extra income and is working full time, but she's also applying for aviation scholarships. She may not know how she's going to do it, but she knows she will. Despite the challenges in life, with the right attitude and perseverance, anyone can accomplish their dreams, as long as they never give up. Dare to dream! Victoria is, one flight hour at a time. Keep at it Victoria, your story is an inspiring one that nothing is insurmountable no matter how bad the weather is one day there will be a break in the clouds eventually. VFR all the way. Sanjay, What a great comment. Sometimes when you're in that storm it's hard to believe there are clear skies waiting. I too believe she'll find them. Your awesome Toria! You have overcome so much. That commercial checkride is just around the corner. Your CFI will be right after and then your on the other side of the curve. You won't get paid much, but you'll get more hours than you could dream of. I am rooting for you. Pilot, Thanks so much for your comment.She will get her commercial and then some... lots of hours to follow, and many more experiences to enjoy. One hour at a time... she will get there. Follow your dream Victoria, it's never too late. I hit a few road blocks myself; however, I'm getting back in and trying to find the financing to get back and get my CFI ratings finally. Good luck and I believe in you that you will achieve your goal. Anyone can accomplish their dreams, I love that! Thank you Karlene and Victoria for this rousing story. I'm inspired to keep reaching for my own dreams! Thanks for your comment Andrew. It is never too late, and that's a great message for everyone. Never too late, until it's too late. Vic is a great friend and I really appreciate you sharing her story here! Should I Become a Pilot?